I Always make aloo paratha with the normal roti dough. But wanted to try a kulcha recipe, that too with whole wheat, and with out yeast. So tried this recipe, the result was soft, tasty kulcha. I didn't use oven or tandoor. I tried it in stove top. So sharing the recipe ... Try out this soft, yummy kulchas with out any guilt. Boiled Potatoes - 2 Nos. In a mixing bowl, add wheat flour, salt, baking soda, sugar, give it a quick mix, now add yogurt and milk and start kneading the flour sprinkling water to make a smooth dough. Once done cover it with a damp cloth and leave it aside for an hour. Grate the boiled potatoes, add salt, red chilli powder, coriander powder, amchur powder, green chilies, coriander leaves, and mix well. Now take a big portion of dough, roll it to a small circle, keep the stuffing inside, gather all the sides and cover it well. spread it with hands and sprinkle some ajwain on it, and press it well. Then roll it again. 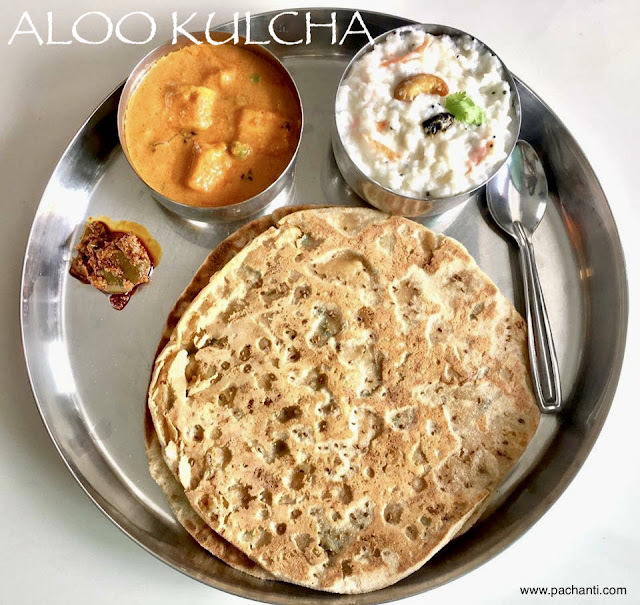 Heat a tawa/pan, Now spread some water on the rolled kulcha ( on the other side where ajwain is not there ), and put the kulcha ( the water side down ) on the tawa. Keep the flame on low. Cook it on slow flame. Now flip the tawa, so that the kulcha will touch the flame directly. We have spread water on the bottom so kulcha will not fall from tawa. So don't worry. slowly show all the sides of the kulcha, so that it can cook evenly, it will puff well. Once done, remove the kulcha from tawa, and spread butter on it evenly . I have started to replace millets in my daily cooking instead of rice. I make bisibelabath, upma, with millets. It is called varagu in tamil, Kodo millet in english, Kodra/Koden in hindi, Harka in Kannada, Koovaragu in malayalam, Arikelu in Telugu. Millets are packed with lots of nutrients and has fibre and vitamins. I was first skeptical to try this dosa as it doesn't had any rice it in. I have tried Thinai ( Fox millet ) idly/dosa but it had rice in it. So wondering whether it will come out good, but when i tried it came out really good, it was very tasty and crispy. 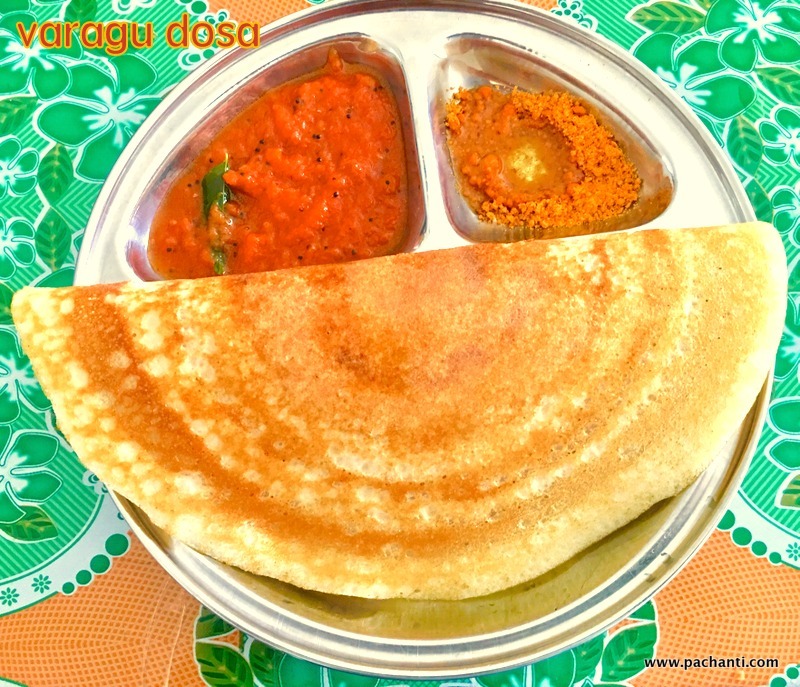 Here we go for the recipe of varagu dosai. You can make idly also with the same recipe..
dal makhani. 100 % restaurant taste, guaranteed :-)). Do try and share your feedback.